The Pope sent Mazarin to Paris at the beginning of 1631 to work out the final details of the agreement. He returned to France again from April to July 1632. He had his first interview with Lous XIII and with the Queen, Anne of Austria, in May 1632. He tried to persuade Louis XIII to send a military expion to capture Geneva, the fortress of the Protestant movement, but the King, who had good relations with the Swiss cantons, rejected the idea. Mazarin returned to Rome in November 1632, and made a new friend and ally, Antonio Barberini, the nephew of the Pope and one of his chief diplomats, and his older brother, François Barberini, the State Secretary of the Vatican. With their assistance, he established himself as a guardian of French interests at the Vatican, and then of Vatican interests in France. in 1632, he was named papal vice-legate at Avignon, and given the religious title of prelate, and began to wear an ecclesiastical costume, though he was not and never became a priest. While in Rome, Mazarin sent regular gifts of flowers, perfumes and delicacies to the women of the French court, and more valuable gifts, including statues and Renaissance paintings, to Richelieu. In 1634 he was named nuncio extraordinary to Paris by Urban VII, with the mission of persuading Louis XIII to undertake a grand naval crusade against the Turks. The goal was to create a combined fleet of the ships of Christian nations to seize the Turkish ports around the Merranean. Mazarin, a realist, knew that, given the rivalries between European powers, this project would never take place. He had established a cordial relationship with Richelieu; Richelieu jokingly referred to him as Rinzama (an anagram of his name), or Nunzinicardo ("dear little envoy), or, most frequently, Colmarduccio, or Colmardo. When was asked what it meant. he translated into French as Frére Coupechou, the term for a junior candidate monk who was assigned to chop cabbage in the kitchen of the abbey. However, he did not send Mazarin on the mission that he most wanted, as delegate of France to a Europe-wide peace conference. 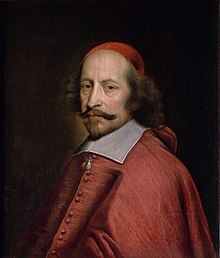 Richelieu's attention was devoted to making war; Richelieu, who was elderly and in poor health, took the King, who was also in poor health, the court and Mazarin on a series of long military expions, to suppress a rebellion in Catalonia, to capture Roussillon, and, in January 1642, to lay siege to Narbonne. On June 11, 1642, while in Tarascon on one of the long military expions, he was presented with evidence that Gaston, Duke of Orléans, the brother of Louis XIII, and The Marquis of Cinq-Mars, one of the King's closest advisors, had made a secret agreement with the King of Spain, without the knowledge of Richelieu or the King. 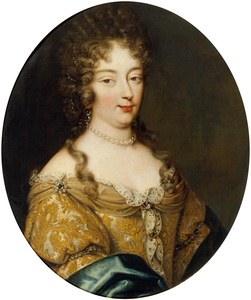 It appeared probable that the Queen, Anne of Austria, was also aware of this secret betrayal of Richelieu, but did not tell him or the King. Cinq-Mars was arrested, Gaston was disgraced, and another conspirator, the Duke of Bouillon, was granted a pardon on the condition of revealing all the details of the plot to Mazarin, and surrendering the important fortress of Sedan to the King. Mazarin did not reveal the participation of the Queen in the conspiracy, but his knowledge gave him even greater leverage at the court. The destruction of the conspiracy against the King was one of the last acts of Cardinal Richelieu. He fell ill and died on 4 December 1642. 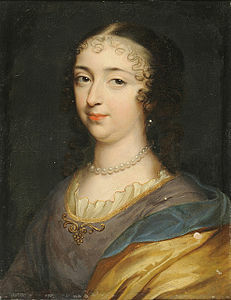 The Will of Louis XIII stated that his wife, Anne of Austria, would not be his regent after his death. 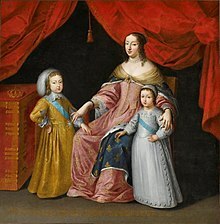 His heir, the future Louis XIV was then only five years old. However, she immediately went to the Parliament of Paris, an assembly of nobles friendly to her, and had his will declared invalid. ^ This section draws upon the chapter Le vaincu de la Fronde deviant monarque absolu by Jacques de Bourbon Busset in Mazarin, ed by Georges Mongrédien (1959). ^ Georges Dethan, "Mazarin, Jules, Cardinal" in The New Encyclopædia Britannica (15th ion, Chicago, 1991) vol. 7, p. 979. ^ Thackray, Anne (1996). "Mazarin family (1) Cardinal Jules Mazarin [Giulio Mazarini]", vol. 20, pp. 895–896, , in The Dictionary of Art (34 vols. ), ed by Jane Turner. New York: Grove. ISBN 9781884446009. ^ Banham, Martin (1995). The Cambridge Guide to the Theatre, second ion. Cambridge, England: Cambridge University Press. ISBN 9780521434379. ^ Aronson, Arnold; Roy, Donald (1995). 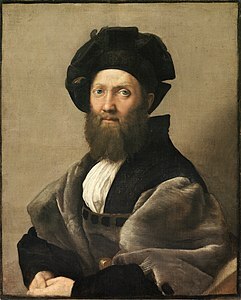 "Torelli, Giacomo", pp. 1116–1117 in The Cambridge Guide to the Theatre, second ion, ed by Martin Banham. Cambridge, England: Cambridge University Press. ISBN 9780521434379.